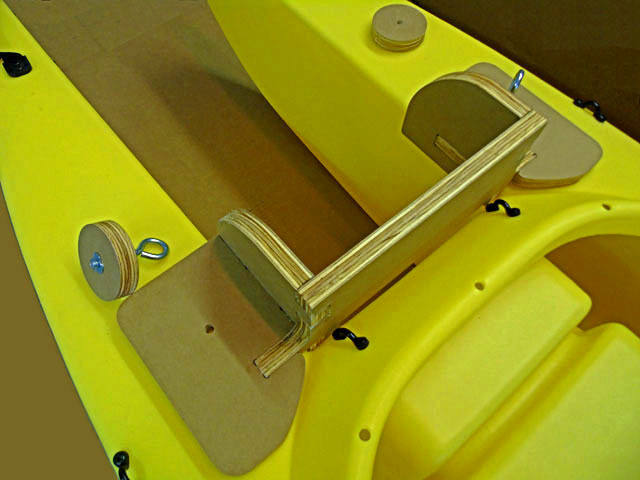 No extra charge when shipped together with a Wavewalk® 500 kayak. The TMM 20-A is made from 3/4″ thick Medium Density Overlay (MDO), a composite wood and polymer resin (a.k.a. plastic) material developed for outdoor use such as signs and marine applications. The front and back of the MDO panels come coated with a waterproof polymer-infused layer, and the sides of the parts that form the TMM 20-A are waterproofed with polyurethane. Unlike the TMM 20 motor mounts that’s made from Trex, which is a heavier material, the MDO used in the construction of the TMM 20-A makes it considerably lighter. The parts from which the TMM 20-A is made are cut with a computerized router for maximal precision, best fit, and optimal strength. They are assembled and glued together with waterproof adhesive. The tab-and-slot technique and ‘caisson’ design applied in this product give it additional strength. There is no need to paint this motor mount, but in case you want to, it can be painted with special paint for outdoor plastic, such as Krylon Fusion spray paint. Regular paint doesn’t adhere well to its surface. Horsepower Compliance: This motor mount was tested with small outboard gas motors such as commonly used with Wavewalk® 500 kayaks. We do not recommended to use it with motors stronger than 3 hp. In case you have a more powerful motor and you want to use it with this motor mount, you’d have to reinforce its mounting plate or get a TMM Heavy Duty (HD) 700 motor mount. Failing to do so is hazardous, and could result in serious accidents. Place the mount as close as possible to the rear end of the cockpit, as seen in the picture below, make sure it is centered, mark the two spots where you’d need to drill 3/8″ holes for the blots, and drill. Bolt the motor mount in its place by tightening the nut knobs with their Tee nuts facing down. You can secure the mount in place with an extra pair of 5/16″ nuts. Doing so could reduce unwanted vibrations resulting from the wooden knobs getting loose. Looks great, Yoav………..and only 2.5 lbs. Looks like it should weigh considerably more. Yes, MDO is a much lighter material than Trex, since Trex is very dense. The MDO gets its strength from the overlay structure of the wood fiber.